With warheads to hand, for how much did Doctor Evil hold the world ransom? 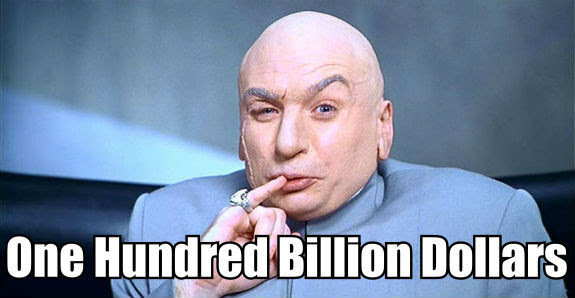 That’s right, $100 billion dollars. Here’s a clip if you’re not a follower of the good Doctor. 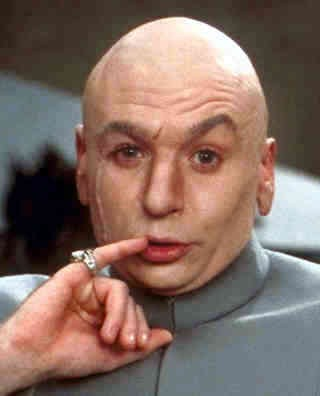 One hundred billion dollars is serious money. If you received $1,000 a day, seven days a week, how long would it take you to collect 1 billion dollars? The answer is 2,737 years. And that’s 1 billion. Add a couple of zeros for 100 billion. So how is it that a bank with $100 billion dollars in assets – Ally Bank – can spend millions on an advertising campaign that so misunderstands the use of positioning? Their new commercial is to solicit retail customers / depositors to the banking brand. It opens with the potential customer talking to a bank representative on the other end of the line. The woman then flashes on some “new things” that she’d tried in the past that had given her: electric shocks, attacked her pet cat and started a fire in her kitchen. Here’s a look at the 30-second commercial. Positioning makes the unfamiliar, familiar, by tying it to something that is already in the mind. So why in the world introduce the unfamiliar brand by tying it to painful and damaging experiences? Yes, I know, the producers think the incidents are funny and that by showing them they will remove the fear of depositing money in a “new” bank. Why not have the prospect recall trying “new” things that turned out well? Her husband encourages her to try a new restaurant on the “other” side of town. She’s skeptical, but goes and winds up loving the place; her son talks her into going white water rafting. She’s “scared” but goes and has the time of her life. Anything along that line that says, Sure, new things can be a challenge, but they can turn out marvelously. Tie the brand to a wonderful experience. I had never heard of the bank and in doing a bit of research for this article, I looked into it. The fact is they have an interesting “structure.” It is totally online with 24/7 customer service, no fee ATM service anywhere and an App for your smart phone or computer that let’s you make deposits from anywhere via the digital universe. I also reviewed their financial statement and their bank rating. They have a very decent balance sheet and four stars out of five at www.bankrate.com. (If you are wondering how a bank with $100 billion in assets is “new”, they were an in house auto financing arm at General Motors for decades and so had tens of billions in auto loans. A few years ago, they spun off as a more traditional bank and are now soliciting retail customers). They know how to make good loans but need to call us for some positioning advice. Of course you don’t have to be a $100 billion dollar bank to get world-class marketing advice. We help businesses of all sizes increase response to their marketing, advertising and public relations campaigns.